The build up to what could be one of the biggest games in Brighouse Town Ladies’ short history has begun. Town welcome second- placed York City to the Dual Seal Stadium, Hove Edge, this Sunday (2pm). Town have been hit like many other clubs with a string of postponements during the last few weeks which manager Rob Mitchell is hoping won’t have an adverse effect on his side’s momentum. 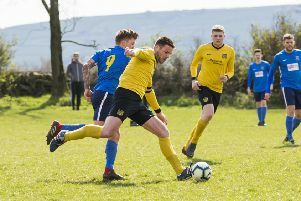 “We have had a superb start to the campaign and at the half way stage we are right on track in terms of where we want to be at the end of the season,” said Mitchell whose side are bidding for promotion. “Our opponents on Sunday will be full of confidence having watched them myself on Sunday come back from 3-1 down to win 4-3 against a good side in Boldon. “I know the quality we have and we’ve made some brilliant signings in the last couple of weeks to hopefully give us the edge going in to the final stages of the season. “It would be great if we had a big following on Sunday in what could potentially be a title decider. Town have a couple of absentees with both Emma Dobson and the prolific Jodie Redgrave missing the game as they are both out of the country. This is on top of a long-term injury to Kayleigh Bamforth who has now started light training after her fractured ankle. The injury has kept the highly rated defender out for 10 weeks, with Bamforth expected to make an appearance for the development team on the 21st of this month depending on how her rehab goes. Sunday’s game should see a debut for Beth Davies who, along with Emily Starkie and Cara Mahoney, signed from Leeds last month, with both expected to start the game which is a must not lose game in the words of Mitchell. Brighouse Town Ladies have been hosting FREE football sessions to girls aged 4/5/6/7 at All Saints High School, Fixby, with great success. The group is gradually growing and the quality on show is superb. The sessions are aimed at girls of all abilities with the focus very much on fun and developing core motor skills which will only help the girls technically.